Istanbul—To reach the Istanbul headquarters of the People’s Democratic Party (HDP), you have to find a place to cross a chaotic six-lane highway lined with a jumble of buildings that look as if they’re waiting to die. On its north side, a trompe l’oeil construction fence interrupts the narrow pavement to present the future facade of Tarlabasi 360, a pricey business and residential complex being built by Calik Holdings, whose CEO—the son-in-law of Turkish President Recep Tayyip Erdogan—recently stepped down to run for Parliament. The road, widened in 1986 with the destruction of many grand Ottoman-era Greek and Armenian buildings, cuts off the decaying neighborhood of Tarlabasi from Beyoglu’s thriving cultural and commercial center. A five-minute walk from the modern stores and cafes of Istiklal Avenue, families live in a single room in half-ruined houses. Kurdish women in lace-edged head scarves squat over basins of mussels to scrape for the tourist trade. A man in a leather jacket minds a small flock of sheep parked on a concrete corner. Barefoot children—some of them Syrian refugees—play under lines of laundry strung across narrow streets, or click toy pistols, or rush past gleefully with spray bottles and squeegees to risk their lives cleaning windshields on the growling highway. 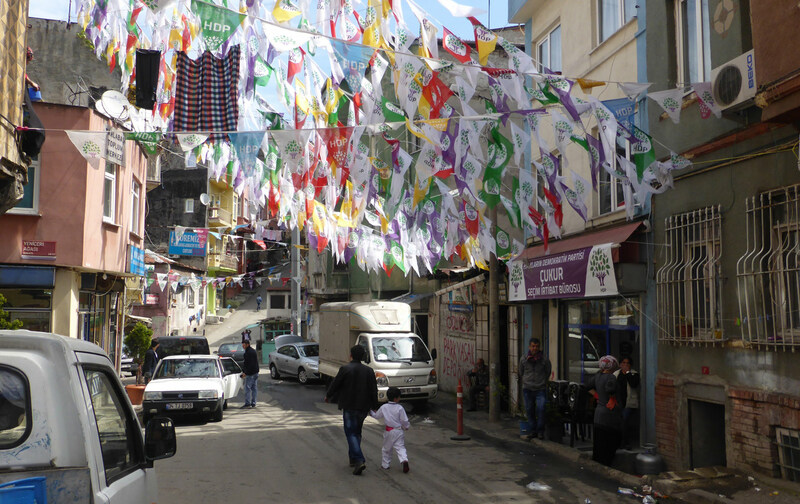 Now, in the run-up to Turkey’s June 7 vote—”a life-and-death election,” says Bilgi University professor Ayhan Aktar—the laundry is joined by the white, yellow, purple, red, and green bunting of the HDP, frothing overhead like the flounces of some celestial petticoat. Founded two years ago by members of the Kurdish Peace and Democracy Party and various left, green, feminist, LGBT, and ethnic-minority groups, the HDP has become the last, best hope for Turkey’s liberals and leftists of blocking Erdogan’s drive to rewrite the Constitution and concentrate yet more power in his own hands. If his ruling Justice and Development Party (AKP) wins a large enough majority, Erdogan plans to establish an executive presidency to “strengthen the national will,” removing what he calls the “obstruction” of a “multiheaded” Parliament and allowing Turkey to “leap forward and beyond the level of contemporary civilizations.” To stop him, the HDP has to win at least 10 percent of the vote. If it fails to pass that threshold, Turkey’s electoral system gives all its ballots to the next party in each district, which in most cases will be the AKP. The HDP sees Syriza as a fraternal party: On paper, at least, they’re both upstart left coalitions with links to direct democracy and commitments to civil rights, standing against neoliberalism and corruption. But the HDP has a far wider internal gulf to straddle between its socially conservative Kurdish base and the radicals, liberals, feminists, and gay activists energized by the Gezi Park protests of two years ago. Many of them mistrust the Kurdish nationalists, concerned that the wily Öcalan might cut a deal with Erdogan, swapping more Kurdish autonomy for increased presidential powers. (Öcalan, leader of the militant Kurdish Workers’ Party, or PKK, is serving a life sentence for his part in a guerrilla war that has killed some 40,000 Kurdish and Turkish soldiers and civilians; for the last two years, he’s been negotiating with the AKP from his island prison.) And though equal representation for women is built into Kurdish politics, for most rural voters, the Gezi crowd and its sympathizers may as well have come from Mars. I met Paylan at one of the events on April 24 commemorating the genocide: a gathering of Armenians, mostly from the diaspora but also from Istanbul, and some of their Turkish supporters, crowded onto the pavement outside a pharmacy on a busy road not far from Taksim Square. This was the site of the house where the Armenian musician Gomidas was arrested a century ago on the orders of Talaat Pasha, to be deported with more than 200 other Armenian intellectuals—the beginning of a series of deportations and massacres in which more than 1 million Armenians died. Two evenings earlier, we had all been at a concert of Armenian music and poetry in a vast, packed theater deep underground in one of the city’s gargantuan new developments. Later that day, we marched along Istiklal Avenue with what looked like the whole of activist Istanbul, bearing black signs that read we are here in Armenian and chanting slogans like “No liberation alone, either all together or none!” and “Shoulder to shoulder against fascism!” A small group of right-wing nationalists at either end of the march was kept neatly under control by rings of riot police, whose sole aim seemed to be to make sure the demonstration took place without incident. Not so the May Day protests a week later, when all of Beyoglu was in lockdown and 203 people were detained by the police, who used tear gas, water cannons, batons, and rubber bullets against peaceful demonstrators. Turkey, friends who live here tell me, feels more and more like a police state; it’s hard to argue that the election will be “fair” in anything but name. More than 70 people (including a boy of 16) have been prosecuted for insulting Erdogan since he was elected president last August; the AKP is illegally spending public funds on its lavish election campaign; there’s been a rash of bomb attacks on HDP offices; and the party has tightened its grip on the media. Government-made conspiracy theories spread like invisible gas. Erdogan’s paranoid style is unsettlingly contradictory, appearing to give with one hand while taking away with the other. None of the Armenian events could have happened a few years ago; nor would a government minister have attended the memorial service at the Armenian Patriarchate; nor would Prime Minister Ahmet Davutoglu have offered condolences to the Armenians, as Erdogan himself did for the first time last year. Yet a few days earlier, Turkey had recalled its envoy to the Vatican because Pope Francis used the G-word, while Davutoglu accused the pontiff of joining an “axis of evil” against the AKP. Erdogan, waving his virtual scepter, decreed that the European Parliament’s recognition of the genocide would go “in one ear and out the other,” even as he threatened to “deport” Armenians from Turkey. On April 24, Erdogan was not in Istanbul but at Gallipoli, where he attended a grand international commemoration of the Allied landings of 1915, normally marked in Turkey on March 18 and remembered as ANZAC Day on April 25 in Australia and New Zealand. A video, played repeatedly on Turkish television, shows the sons of the Ottoman Empire answering the call to defend faith and fatherland against the Allied assault; it ends with Erdogan himself placing a wreath on a grave while his voice intones a patriotic Islamic poem: “Do not leave [your flock] with no shepherd, my God!” No prizes for guessing who the shepherd is; the conscription of the glorious dead for election purposes stirred some debate in Turkey. But the importance of Gallipoli for Erdogan goes deeper than the election, deeper than the wish to detract from the centenary of the Armenian genocide. Celebrated as the last great victory of Ottoman forces against the infidels, it fits with his reimagining of Turkey’s past, bracketing the secularist republican century of Mustafa Kemal Atatürk (a “commercial break” in Ottoman history, according to one AKP deputy) and claiming direct descent from sultanate and caliphate, when Istanbul was the commercial, political, and religious hub of the Levant. When Erdogan became prime minister in 2003, he was (or seemed to be, depending on whom you ask) a more democratic figure. His sterner critics say it was only to open the way to an Islamic Turkey—to undermine the secular republic and with it his political opponents, the Kemalist CHP, and win the votes of the Muslim majority in the country’s vast hinterland—that he first loosened up on Turkey’s minorities. Besides, the European Union, in which Turkey then sought membership, wanted human rights; and a monocultural empire is a bland, colorless thing. Whatever the motivation, from 2005, after a conference about the Armenians was canceled and then allowed, it became possible to speak the words “Armenian genocide” in Turkey. Hrant Dink’s courageous, subtle work at his newspaper, Agos, had already done a great deal to open up the cracks. As Thomas de Waal points out in Great Catastrophe, his history of the relationship between Turks and Armenians, it was Dink who first linked the question of the Armenian genocide to the future of Turkish democracy; who made common cause with the Kurds; and who supported the AKP’s lifting of the head-scarf ban in public institutions—all positions espoused by the progressive movement around the HDP. Coming to Turkey, though, often enriches what it means to be Armenian, filling in colors, details, history. Arlene Avakian, a retired gender-studies professor, talked about her experience at last year’s quieter Istanbul memorial: “They laid out pictures on the ground of the men who were taken, and told what they did, and then there was silence. That’s it. It was really the first time I’d mourned for the genocide. I don’t think that’s happened in the States, at least in the Armenian organizations that I know. There’s anger, not mourning. And if the mourning hasn’t been done, you’re not going to heal. That’s why there’s this holding on, this conservatism in the community.” Nyree Abrahamian, on the spur of the moment, got on a plane to meet her cousins in Vakifli, Turkey’s last Armenian village. The frozen past becomes present—water flowing through stone channels, oranges on the trees. That argument was made in more academic language in 1999 by the Turkish historian Taner Akcam in A Shameful Act, his groundbreaking book on the Armenian genocide. But Helin’s metaphor calls up an echo for me: It’s the fake facade at Tarlabasi, which hides hundreds of displaced families and a gaping hole in the ground. The Kurds who live in that rapidly gentrifying neighborhood belong to Turkey’s last minority; many fled to Istanbul in the 1980s and ’90s from the civil war in the east between the PKK and the Turkish army. Much of Istanbul these days is a vast construction site, where history is pulverized by the claws of excavators and cranes tower over a hollow glass-and-steel new world. It’s construction that has driven the fading economic boom, and construction that feeds the corruption that may yet bring down Erdogan. But then, as the anthropologist Ayse Cavdar tells me, change in Turkey is always sudden; nothing happens gradually. It was so at the start of the republican period, when Atatürk changed the alphabet and banned the fez overnight; now, the destructive tempo suits the pace of global capital. In days like these, honoring the past becomes more than an act of remembrance: It’s a gesture of resistance.